This free online calculator is developed to provide a software tool for calculation of Fixed-end Moments (FEM) , and Shear Force at any section of fixed-ended beam subjected to point load, uniformly distributed load, varying load and applied moments. The loads which are moving to upper direction are contemplated as positive whereas the loads towards the lower direction are assumed as negative. Sagging bending moment is considered as positive and hogging I taken as negative. The clockwise movements and moments are negative and anti-clockwise movement are positive. On the other hand, the anti-clockwise moment towards the left end support is considered as negative in case of fixed end moments; As a result hogging moments takes place in the beam, while the right-end support which is taken as positive also causes hogging. All the distances should be calculated with respect to the source of axes which is taken at the dead left of the beam. Distance unit should be taken as meter and load unit as kN. It will provide the values of BM in kNm and SF in kN. Modifying the spot of segment “x” user can also acquire the values of B.M instantly at various segments of the beam. On the contrary, it is suggested to take the aggregate of the results of all the cases if the load amount is more than one by applying the principle of superposition. Calculated figures can be utilized to outline the bending moment diagram. 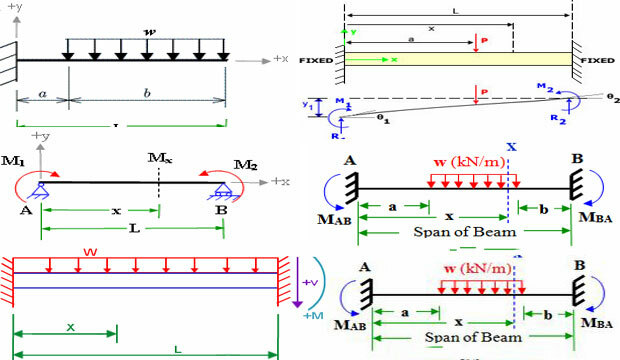 Fixed Beam Bending Moment Calculator is useful to determine the ordinates of influence line diagram for structures.